Usually this tree found in river banks, the leaves are alternate, compound. The white flowers are found in axillary racemes. The pods are oblong and woody. The single seed is present inside the pod is kidney shaped. 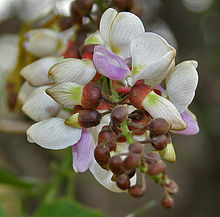 Wounds, ulcers, itching, indigestion, constipation, purifying the blood, chest complaints, chronic fever, leprosy, lumbago. The root and bark decoction is given for wounds, ulcers, and itching. The leaf infusion is given for indigestion and constipation. Seed decoction is given for blood purification, chest complaints, and chronic fever. The oil is exacted from the seed is applied for rheumatic pains, itching, leprosy, lumbago.